This is for both pieces. 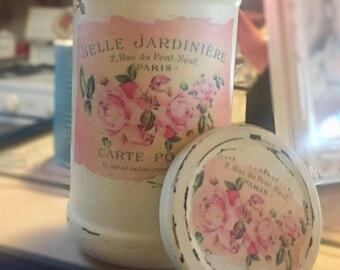 You get one painted jar with lid and matching canister with lid. 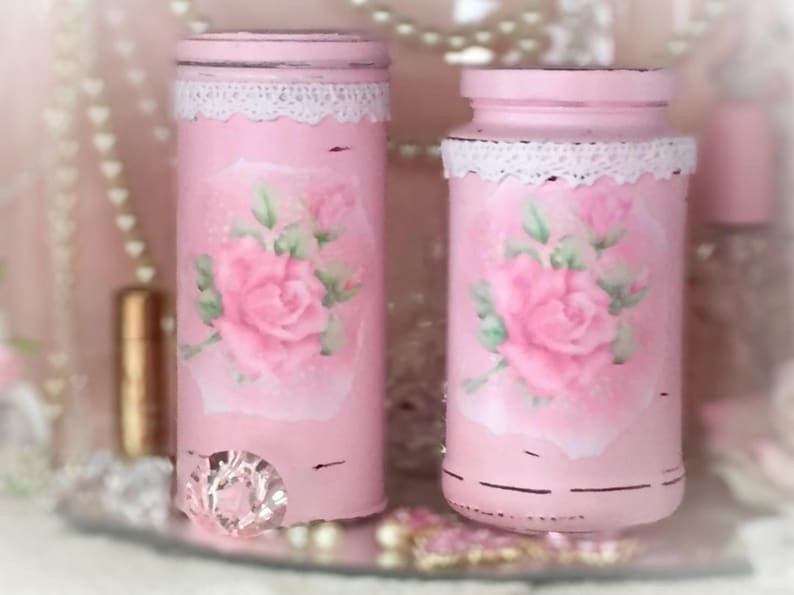 I have hand painted a recycled glass jar and recycled tin can, painted in a beautiful romantic pink, lightly distressed/chippy style and decoupaged beautiful pink roses on the front and lids. The lids are lightly dusted with an iridescent glitter. Lastly, both are adorned with white lace trim. Please note, the can in the photos is a bit smaller than the one you will receive. See measurements. 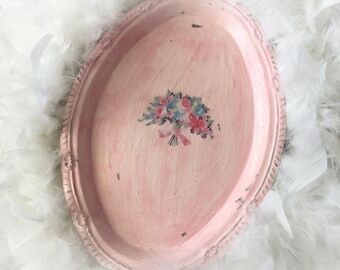 These would be beautiful in your bathroom, vanity area, bedroom, office, nursery, dorm, anywhere in your home you want to add some instant shabby chic charm. Makes a perfect housewarming or hostess gift too. Measurements: Can is 7" inches x 4" inches. Jar is 5.5" inches x 2.75" inches- HOWEVER, SIZES MIGHT VARY A LITTLE BIT DUE TO MY CURRENT STOCK. All the background items, flowers, props, decor, etc., are not included. Each of my items are handcrafted by me. Most designs are created from salvaged recycled materials then "upcycled", altered, repurposed, embellished and made pretty for you! 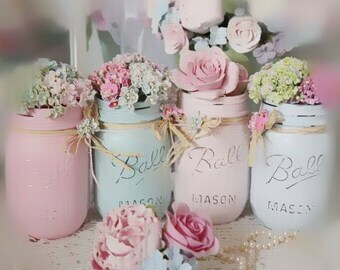 Keep in mind that your item is most likely from recycled salvaged materials and may show signs of little wear, small areas of rust, small little dents, etc., but that adds to the rustic and shabby chic charm.